Will New Russian Force Be 'Putin’s Personal Army'? FILE - Russian President Vladimir Putin, left, and General Viktor Zolotov, commander of Interior Ministry troops, confer in the Kremlin in Moscow, April 5, 2016. Zolotov is slated to lead the new National Guard. While Russian lawmakers are busy changing the country’s election laws in preparation for parliamentary elections this year, the lower house of parliament is due this month to consider whether President Vladimir Putin’s new National Guard should be allowed to shoot Russian citizens without warning. Taking this one step further, the Duma's committee on defense has proposed that National Guard members be granted immunity from any legal liability for actions they take that result in casualties. Russia's RBC News quoted the committee as saying “we believe that in these cases, the risk of harming random individuals will be justified,” and that members of the force "should not be held liable” if they need to open fire. FILE - Police officers detain a protester during an unsanctioned protest in Moscow, Russia, Dec. 30, 2014. According to other provisions of the draft law, the National Guard would be authorized to quarantine an area to control riots, and to commandeer private citizens’ vehicles to get to a crime scene or chase criminals. The proposed legislation would also give the National Guard the right to take full control of any communication networks, if deemed necessary. Service members would be allowed to search homes, vehicles and individuals “if there are sufficient grounds to suspect them of committing a crime or an administrative offense." The bill also says the National Guard would be staffed by conscripts as well as contract personnel. The National Guard would also have a mandate to take part in peacekeeping missions abroad, as well as an intelligence-gathering function in order to fight terrorism, extremism and organized crime. Some experts in Russia and the West claim the creation of the National Guard is timed with the country's parliamentary elections, set for September 18. When asked, Kremlin spokesman Dmitri Peskov said he could not explain the timing. Mark Simakovsky, nonresident senior fellow at the Atlantic Council and former country director for Russia at the Pentagon, said Kremlin authorities were taking precautions in the run-up to the September parliamentary elections, as well as the 2018 presidential elections. “Although Putin remains very popular, the regime has concerns with economic decline in the country, as well as issues related to sanctions,” Simakovsky said. He added that the Russian president "wants to make sure that any and all domestic dissent will be suppressed rapidly." 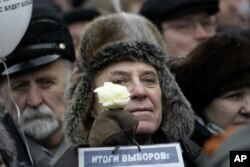 Tens of thousands of Russians participated in protests in late 2011 after parliamentary elections were marred by allegations of unfairness and fraud. Many people, including some opposition leaders, were jailed. As recently as February, Putin said “enemies abroad” were trying to interfere with the parliamentary elections and tasked his security services to prevent any such actions. With a nearly unlimited mandate, the National Guard may not simply discourage large-scale demonstrations but may also send a clear message to the West. “The Russian president has always been paranoid about Western interference in Russia. This decision sends a signal to Western powers that there will be no 'Maidans' in Russia,” Simakovsky told VOA, referring to the protests in Ukraine that led to the ouster of that country's Moscow-backed president, Viktor Yanukovych, in 2014. At the moment, the size of the Guard force has not been confirmed. Unconfirmed estimates range from 250,000 to 400,000. With a wide mandate and armed with tanks, heavy artillery and attack aircraft, an entity of this size would be a very powerful force. “This looks to be Putin’s personal army. Basically, you have a person who can declare his own wars on countries with small armies,” said Anna Borchshevskaya, Russia expert at the Washington Institute for Near East Policy, in an interview with VOA. Other European national guards are “dwarfed compared to Putin’s National Guard in sheer numbers,” she said. The contrast is especially stark in some cases. For example, the Lithuanian Armed Forces consist of about 16,000 soldiers, and the Latvian National Guard has some 11,000 personnel. Given its proposed “peacekeeping” function, Borchshevskaya said, the Kremlin will be able to use the National Guard to intervene in neighboring countries. 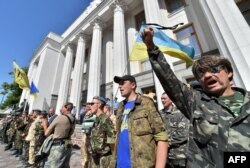 Maidan self-defense activists shout slogans in front of the Ukrainian parliament building in Kyiv on July 1, 2014, as they call for the ratification of an agreement with the European Union. General Viktor Zolotov will lead Russia’s National Guard, which will absorb the Russian Interior Ministry's “shock forces,” including the Special Purpose Mobile Units that have been used to break up opposition rallies and were used in Russia's two military campaigns against insurgents in Chechnya. Zolotov, 62, headed Russia's Presidential Security Service from 2000 to 2013, after which he was commander of the Interior Ministry's Internal Troops. He has known Putin since the early 1990s, when Zolotov was a bodyguard for then-St. Petersburg Mayor Anatoly Sobchak and Putin was an adviser to Sobchak. As head of the National Guard, Zolotov will have a cabinet-level seat in the Security Council, the powerful Kremlin advisory body, and will report directly to the president, bypassing the interior minister.